This low carb cheesy broccoli cauliflower soup is a healthy, creamy version of your favorite comfort food and is the perfect quick and easy lunch or dinner recipe! Made with just 9 ingredients, this soup is packed full of veggies and is dairy free, gluten free, vegan, paleo, and Whole30 friendly! If you are anything like me, broccoli cheese soup is one of your favorite soups! I used to get a big bowl of broccoli cheese soup in a bread bowl in college at least once a week! This soup is like a big cozy hug that you just never get tired of having! Well I wanted to make a healthier version that was also lower in carbs and packed full of veggies! 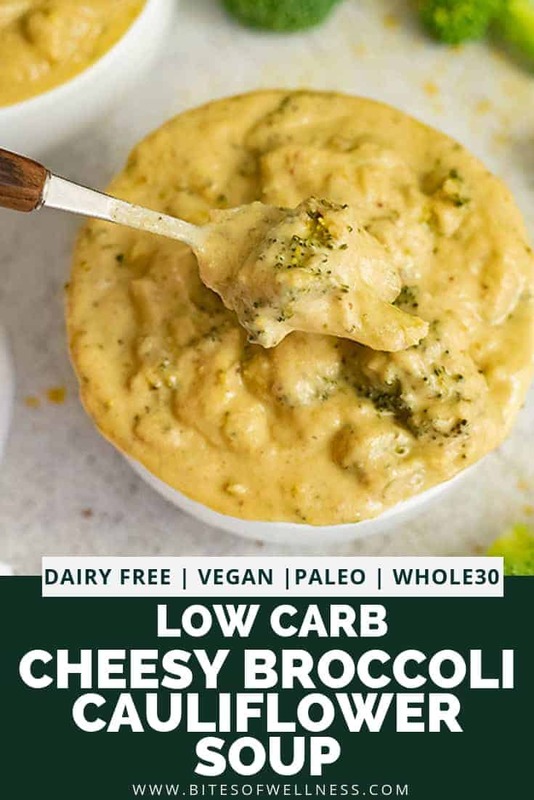 This low carb cheesy broccoli cauliflower soup is similar to my vegan broccoli cheese soup except this recipe doesn’t have any beans, making it lower in carbs and paleo and Whole30 friendly! I am always looking for ways to increase the veggies in my favorite dishes! And this recipe has an entire head of cauliflower and 2 heads of broccoli, but you would never guess it! Most of the carbs in this recipe come from the broccoli and the cauliflower. This makes this broccoli cauliflower soup high in fiber! Overall this recipe has about 22 net carbs! If you wanted to reduce the carbs even more, use the vegan cream cheese mentioned below instead of nutritional yeast. What ingredients do you need for dairy free cheesy broccoli cauliflower soup? What equipment do you need to make this broccoli cauliflower soup? To puree the cooked cauliflower florets, I used an immersion blender right in the instant pot. If you don’t have an immersion blender, you could also use a high speed blender or a food processor. 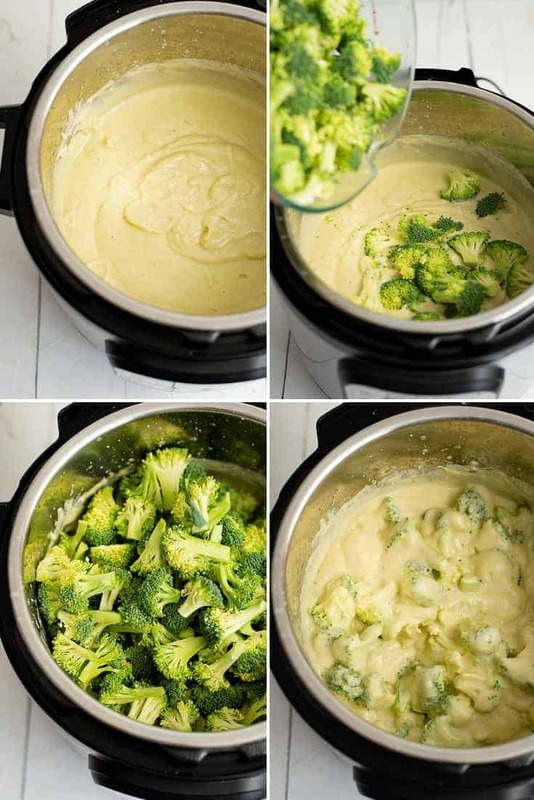 How do you make creamy broccoli cauliflower soup in the pressure cooker? Start by chopping the cauliflower into florets and steaming it in the pressure cooker for 3 minutes on high pressure (in a steamer basket) with 1 cup of water. 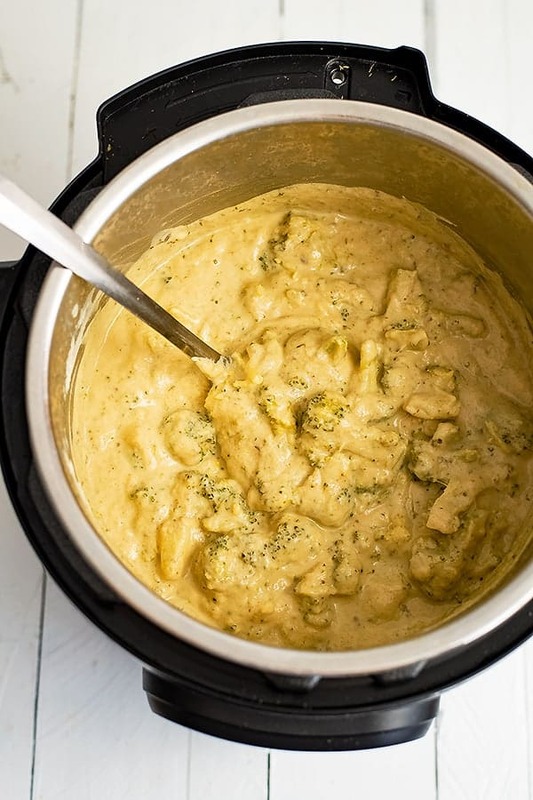 While the cauliflower is steaming, make the creamy garlic sauce in the high speed blender or bullet. I used a Ninja Bullet for this. Combine the hemp hearts, garlic olive oil, water and 1 tsp salt in the blender and blend on high for about 1 minute until the sauce is creamy. After cooking in the pressure cooker, manually release the pressure and remove the steamer basket full of cauliflower from the instant pot (carefully). Pour out the liquid in the bottom of the pressure cooker insert and place the insert back into the pressure cooker. 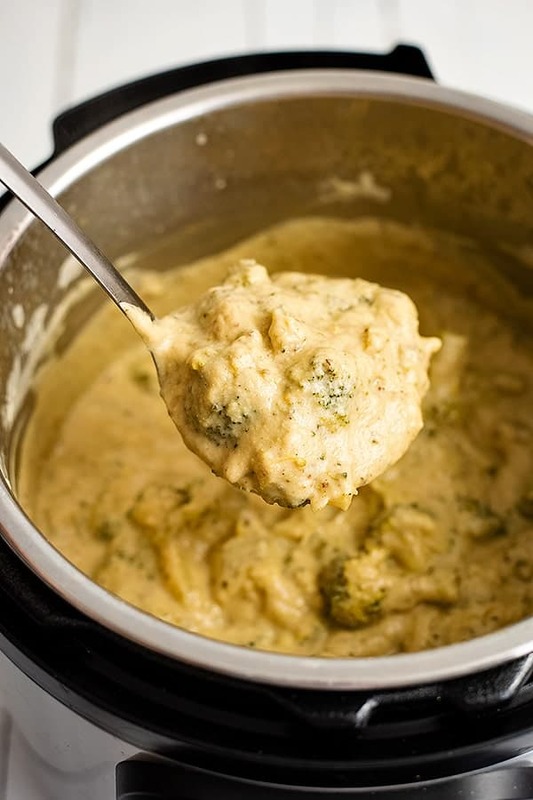 If you are using an immersion blender, pour the steamed cauliflower into the pressure cooker and add the creamy garlic sauce and 3 cups of vegetable broth. Blend together with an immersion blender. 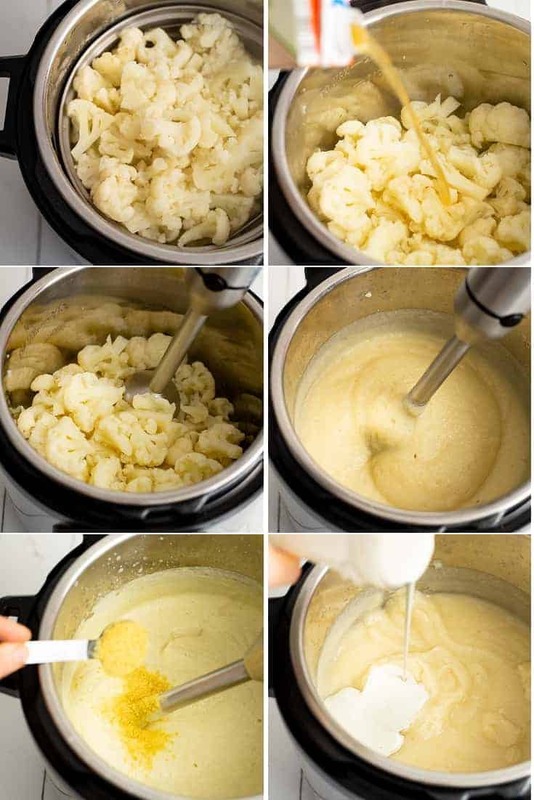 If you are using a food processor or a high speed blender, you will likely have to blend together the steamed cauliflower, creamy garlic sauce and vegetable broth in batches so you don’t burn yourself from the heat of the cauliflower. Add 1/3 cup of nutritional yeast to the blended cauliflower mixture with ½ tsp. salt, 1 tsp. garlic powder, and 1 tsp dried thyme. Stir well (I used the immersion blender to make stirring quick). Taste the mixture and add up to 2 more tablespoons of nutritional yeast and ½ tsp of salt depending on your preferences. Chop the broccoli florets from the stalks into bite size pieces. Add the broccoli to the cauliflower mixture and add 1 cup of vegetable broth. Stir well and put the pressure cooker lid back on. Turn the pressure cooker on manual and set to 0 minutes. This will allow the pressure cooker to come up to pressure but will turn off as soon as it comes up to pressure. You may get a BURN reading for this but that’s ok, the broccoli will likely be cooked through enough. After the pressure cooker is done, manually release the pressure and stir well. After cooling off for some time, taste for seasoning. How do you thicken cheesy broccoli cauliflower soup? 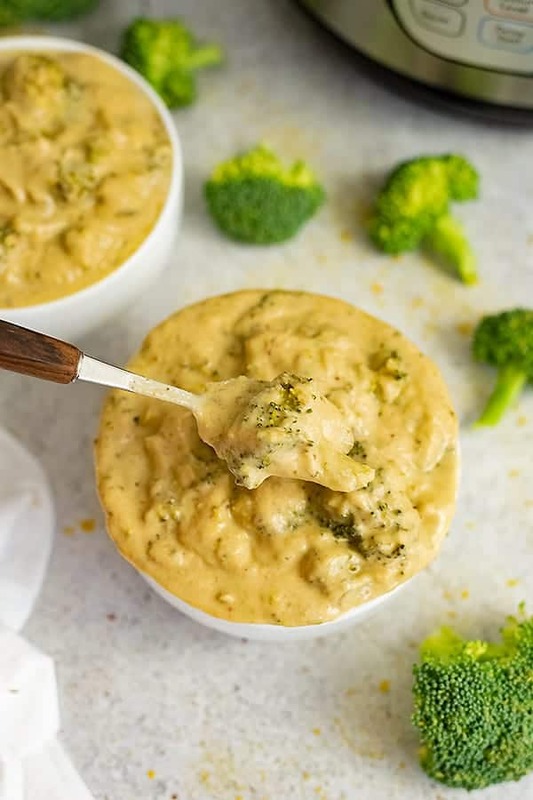 Instead of using a thickening agent, this creamy cheesy broccoli cauliflower soup is thickened by pureeing up the cauliflower with creamy garlic sauce and nutritional yeast. No need for any added thickeners or flours! This also helps keep the recipe lower in carbs! What if you can’t find nutritional yeast? If you cannot find nutritional yeast or cannot have it because of an allergy or sensitivity, you can simply leave it out (the soup is still really good without it) or you can use a vegan (or regular) cream cheese or cheese instead. I really like using Kite Hill Chive Cream Cheese in soup recipes, and you could use about 2-3 tablespoons in this recipe if you don’t like nutritional yeast. The stems of the broccoli are often a little woody and are not ideal for soup. You can however peel them and rice them up in the food processor, so don’t throw them away! Broccoli can easily get lost in my fridge and even when I have the best intentions of using it at its peak; it starts to get yellow and sad looking. This soup is the perfect use for that sad looking broccoli! How long does this low carb broccoli cauliflower soup last in the fridge? This soup is actually even better the next day, so be sure to make extra! It last for about 4 days in the fridge in a well-sealed container. I like to store soup in quart size mason jars in the fridge for easy storage and pouring into bowls! Can you freeze this cheesy broccoli cauliflower soup? Yes! This soup should freeze well! Just be sure to allow the soup to first cool off before trying to freeze it! 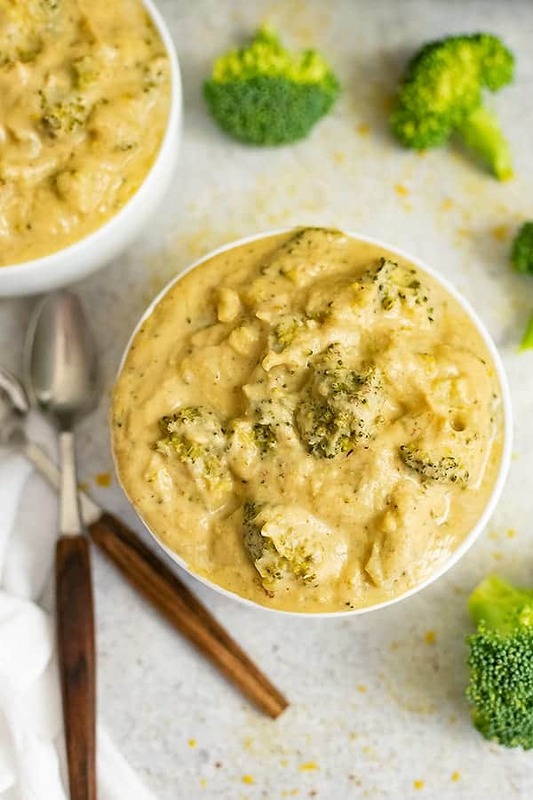 Since the broccoli will continue to break down with more cooking, freezing this soup may cause the broccoli to become a bit mushy with reheating from frozen. However the flavor will still be excellent! Can you make this soup smooth? Yes, you can puree the broccoli as well if you want a totally smooth soup! This might be idea before freezing if you are worried about the texture of the broccoli with freezing! 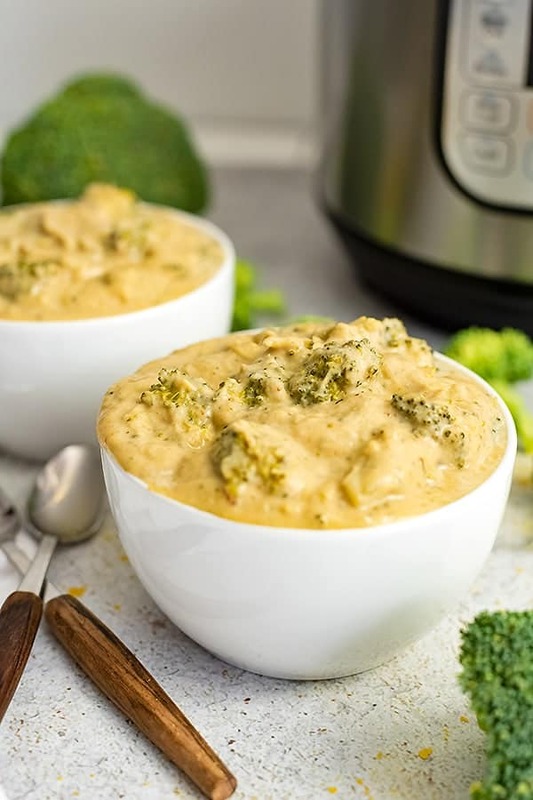 This low carb cheesy broccoli cauliflower soup is a healthy, creamy version of your favorite comfort food and is the perfect quick and easy lunch or dinner recipe! Made with just 9 ingredients, this soup is packed full of veggies and is dairy free, gluten free, vegan, paleo, Whole30 and keto friendly! Place a steamer basket into your pressure cooker. Add the cauliflower to the steamer basket and add 1 cup of water. Carefully remove the steamer basket full of cauliflower from the pressure cooker. Take the insert of the pressure cooker and pour out the water. Add the cauliflower back into the pressure cooker (no more steamer basket) and add the creamy garlic sauce, 3 cups of vegetable broth and blend with an immersion blender until smooth. See post for tips if you don't have an immersion blender! Chop the broccoli florets into bite size pieces. Add them to the cauliflower mixture in the pressure cooker. Add the last 1 cup of vegetable broth and stir. Place the lid on the pressure cooker and close the vent to sealing. Manual pressure, high heat to 0 minutes. After cooking, manually release the pressure. NOTE: If you get a BURN error, that is ok, just release the pressure manually and the broccoli should be cooked through. After the pressure is removed, take the lid off and stir well. Allow to cool and serve hot! Place a steamer basket into a large pot. Add enough water to cover the bottom of the pot and allow the water to come up to a simmer (over high heat). Once simmering, add the cauliflower to the steamer basket and cover. Cook for 6-7 minutes (over high heat) or until the cauliflower is fork tender. Turn off the stove. Remove the steamer basket and drain the water from the pot. Add the steamed cauliflower back into the pot and add the creamy garlic sauce, 3 cups of vegetable broth and blend with an immersion blender until smooth. See post for tips if you don't have an immersion blender! Chop the broccoli florets into bite size pieces. Add them to the cauliflower mixture in the pot. Add the last 1 cup of vegetable broth and stir. Place the lid back on the pot and cook over medium heat for 10-15 minutes, stirring occasionally until broccoli is tender but not over cooked. Yum! This looks so hearty! Thanks for sharing!